We’re going to be running interviews and features here from time to time that don’t quite fit into our printed magazine. Our first web feature is on The Catastrophone Orchestra, a writing collective based in NYC that have been regularly featured in our pages from the very first issue. They’ve got a book out, now, too, collecting their fiction and non-fiction alike. It’s called, fittingly enough, Catastrophone Orchestra and it’s available from Combustion Books, who also publish our magazine. (As well as Amazon and all those places too, if you’d prefer, including as an ebook. I sent several of them questions for this interview, but true to form, they chose to answer collectively. SteamPunk Magazine: What is the Catastrophone Orchestra? How did you all get your start? 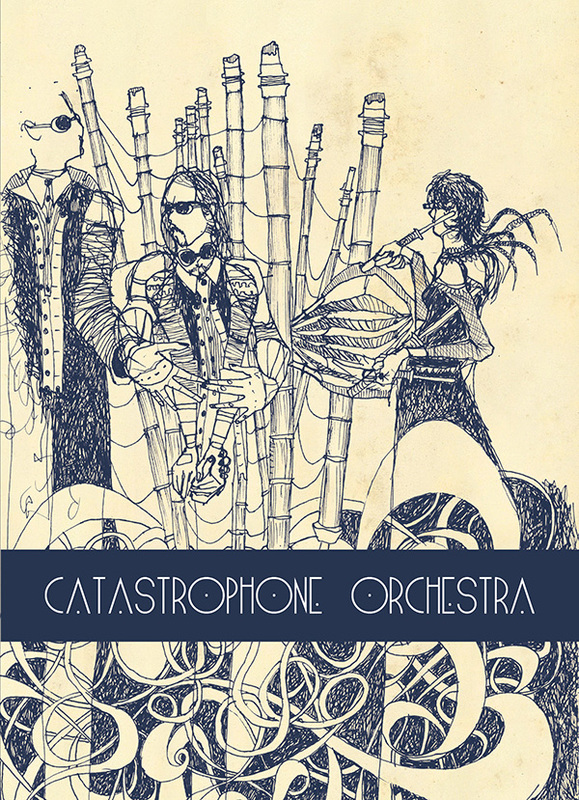 Catastrophone Orchestra: The Catastrophone Orchestra started in the fall of 2004. We were an ad hoc group of anarchists, artists, musicians, authors, and over-all miscreants living together in a collective house in Queens. We were following the steampunk scene and were interested in creating a new instrument that used steam power, so we actually started by doing experiments in the kitchen with a series of modified 1920s pressure cookers. It was dangerous but enlightening and at times a bit deafening. We were interested in how the most interesting stories of the 19th century were being ignored by steampunk and set out to try to rectify the situation. We first thought we would write little booklets about the CO to hand out at any shows we might play, but even though we did a soundtrack for some indy movie about Captain Nemo the fiction took over and we kind of dropped the music. I guess our first real work was the steampunk manifesto [“Colonizing the Past So We Can Dream the Future”] that we wrote and put out on the internet. 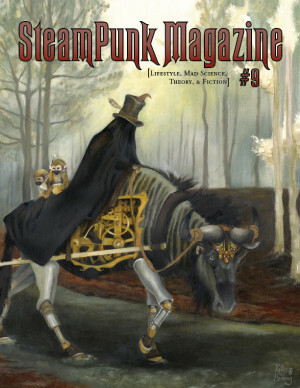 It was eventually picked up by SteamPunk Magazine issue #1. SPM: You write seasonals, a long-dead form of fiction. Why is that? What attracts you to the genre? CO: The seasonal is fascinating because it was so popular and so many Victorian authors we read today used the form–it was an exceptionally good way to get paid to write short stories. It’s amazing that the Victorians, who had one of the most amoral societies of recent history, were so obsessed with teaching morals to the very people they oppressed. Seasonals were written by the middle class for working-class magazines to instruct the working class, through entertainment, in society’s moral order. This was the same moral order that sent six-year-olds in to clean soot-filled chimneys and forced opium on China so the imperialists could get tea. We felt that Victorian-style hypocrisy was still alive and well in the 21st century and thought it would be interesting to revive the form with a bit of twist. We used it not to praise the Victorian era, or our own, but to show how the futility of being moral in a corrupt society. The “rags to riches” concept was such inane propaganda for the exploitative capitalist system, and it’s still with us in the form of game shows, reality television, and other entertainment forms. Alan Moore’s League of Extraordinary Gentlemen had a huge influence on us, especially his cynical take on Victorian morals. It is also fun to write a genre, even if no one remembers the formulas of that genre. It forces you to really focus on the story and what you are trying to convey. SPM: You consciously write steampunk fiction, but it’s placed in the Lower East Side of New York City in the late 19th century instead of, well, England. Why did you decide to do that? CO: First of all we live in America, New York specifically. We also felt that too much Steampunk was Anglophilic. We felt there were great stories to tell about New York during the 19th century and we were eager to share them. Since our work is as much about the present as the past, New York makes sense. Today the US represents the same place England did in the 19th century; a dying empire trying to find relevance in a changing world. It makes sense to set our stories here in the US since that is the society we are critiquing; just as Dickens wrote his stories about London. For folks interested in steampunk, New York is a great setting. In many ways the US during the 19th century was much more steampunk than merry ol’ England as far as outrageous and impractical technology goes. New York was already becoming the hub of technological innovation attracting people like Tesla, Edison, etc. It was also the birth place of organized labor, the first real resistance to the exploitation of the industrial revolution. All of these things made sense to us and there was never a thought of setting our stories anywhere but the Big Apple. SPM: There’s an incredible wealth of historical detail in your work–you’ve clearly researched the underclasses of the time and place quite thoroughly. How do you go about bringing that kind of information into your stories? What are some of the crazier and more interesting cultures and events in the history of the Lower East Side? CO: We do a ton of research all the time about this era. Most of it never makes it in the stories. We do sometimes do a bit of specific research for a story, but most of it we have had banging around in our skulls for years before it ever gets put to ink. For us the details and asides about how people lived in the tenements are crucial for understanding the characters and the choices they make. We would probably disagree with one another about what are the most interesting aspects and sub-cultures of New York’s 19th century. I myself [Professor Calamity] am fascinated with the amazing complex and diverse scavenger ecology that allowed the city to even exist. Without nightsoil-men, mudlarks, bone and rag men, etc. New York could not have existed…it would have been inhabitable. Mathilda is very interested in girl gangs of the period and how they have been left out of the history of feminism. Neal is most interested in labor struggles and the street slang of the period. All of these things will eventually make it into our writing (both fiction and non-fiction). We also love the fact there was a fad among dandies to shoot orangutan adrenalin. It was a pretty bizarre period and endlessly fascinating. SPM: Finally, you all write collaboratively, something that isn’t too common these days. What is your process like? What attracts you to writing in that way? CO: Our process changes from story to story. Sometimes we get around the computer and take turns typing with the others reading over their shoulder and chiming in, arguing and making fun of each other’s typos. Sometimes one person will write one section and get stuck and someone else will take over. What is the same is we all sit in our living room and brainstorm plots, themes, and historical tid-bits before anything gets written. This part of the process, which is also the most fun, always takes longer than writing the actual story. It can take days or more to get something we can all agree on. It is exciting to see what the collective conscious can create–it is something more than sum of the participants. So much of our lives are segregated and isolating that it is refreshing and powerful to work on a project together, whether it is writing, setting up a greenhouse, or making music in a band. So much of art was historically collective, it is only now that most of it is seen as a solitary pursuit. It may not be the most efficient way to write, but we find it very effective both artistically and socially. We have written non-fiction, plays, novels and short stories using collaborative methods and for us it works.